Houston Demolition & Debris Removal Services l Dirtwirx Inc.
We often say that we’re the first people you call when you’re ready to get a construction project started. After all, the land needs to be cleared before anything else can be done, and we’re the go-to land clearing guys. But sometimes demolition work has to be done before land can be cleared, and as luck would have it, we’re the go-to demolition guys too! This video below was taken and edited by our client from Houston, Texas. Yes our client, as part of our commitment, we often go through the extra miles making sure every project is being executed perfectly and our clients will often return the favor to show their appreciation. So if there’s an older building on your site that has just got to go, we can take care of it for you. We’ll even clean up after ourselves and haul away the rubble. Then we can seamlessly move on to any land clearing, grading or pad building that needs to be done. That’s what’s so great about a versatile team like Dirtwirx. How to Demolish a House ? Step 1: Permits are obtained and utilities are disconnected. That’s right, as with all of our services, we take care of the paperwork and get the correct permits for demolition in Houston. We also make sure all utilities are disconnected so that we do not cause an electrical fire or some other hazard. Step 2: The building structure is analyzed and a demolition plan is developed. It’s important to understand the structure of the building because non-load bearing walls or supports should be removed before load bearing ones, among other considerations. Also, if the building is older and contains building materials that are now known to be hazardous, such as asbestos or even lead paint, these factors are taken into consideration. Step 3: Demolition takes place. The equipment and tools we use vary and are described below. Step 4: Debris is hauled away and recycled when appropriate. 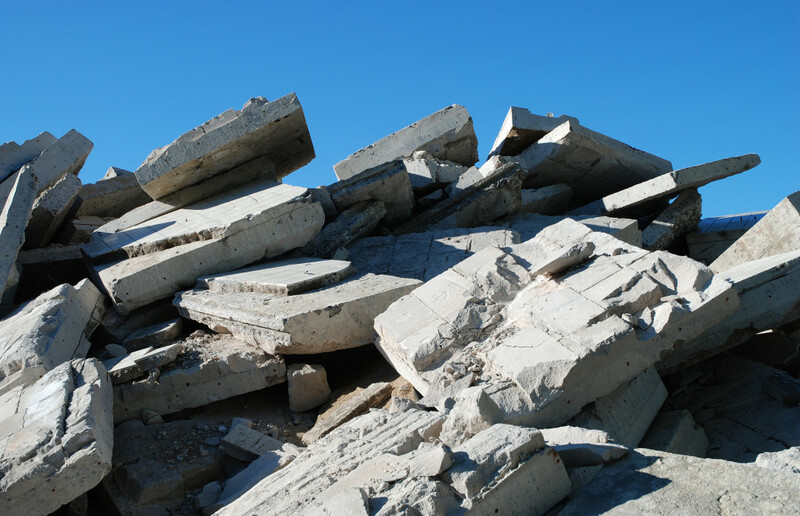 We can often recycle around 90% of the material obtained from demolitions. Of course, it’s not as easy as 1-2-3, and due to potential danger involved and the need for specialized equipment, demolition is best left to the professionals. In rare cases we also use explosives in our demolition work. For delicate projects, we also use a variety of hand tools to remove items of historical value or that otherwise need to be handled carefully to preserve their integrity. “Demolition” is a general term, and deconstruction is simply a type of demolition. Deconstruction relies less on machinery and more on manual labor to carefully remove and preserve elements of a building. Deconstruction is useful in preserving valuable or historic details for use in a future reconstruction project, as historic buildings often lose structural integrity, become dangerous and need to be rebuilt. Deconstruction may also be used to increase the amount of materials that can be recycled in general. 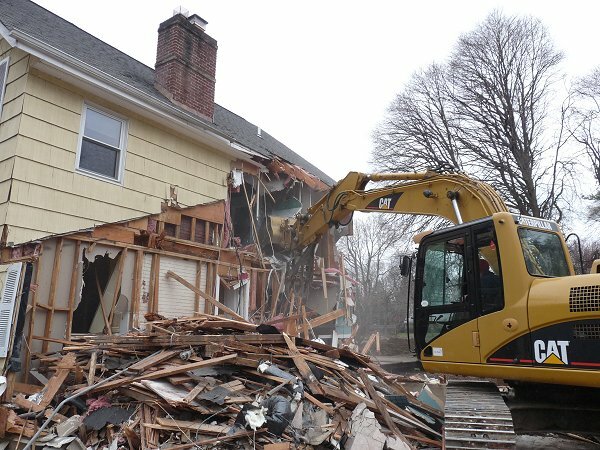 However, as we can typically recycle around 90% of building materials for any given demolition project, other less labor-intensive strategies usually do the trick. What Kinds of Things Are Recycled After Demolition? Not all demolition involves completely razing a building. Sometimes all that’s needed is for part of a wall to be removed to open up your home’s floor plan or to make room for a window or door. While some simple interior demolition can be accomplished as a rewarding DIY project, you should call us if the area is weight-bearing or has plumbing or electrical wires running through it. Our interior demolition services include removing a part of the ceiling to create a two-story ceiling, break up an old tile floor, and more. Give us a call to get an estimate. Asbestos is a type of jagged mineral fiber (sometimes called chrysotile or amosite, the two most common forms) that is heat-resistant, relatively strong and a good insulator. It was incorporated into many building materials before it was determined to be a carcinogen. Specifically, it is a cause of mesothelioma. Due to its toxicity, its use has become highly restricted and is even banned in many countries. It first became popular in the 1800s. Older buildings in particular are more likely to be built using materials containing asbestos. Asbestos may be found in the cement used to secure roofing, siding or flooring tiles, or in vinyl flooring itself. It may be in insulation, particularly insulation remaining from the 1930s-1950s. Materials around older woodstoves, furnaces, hot water pipes or heating pipes may be coated in asbestos. This is just the tip of the iceberg, however, as asbestos can be found in many other seemingly innocuous building materials. How does asbestos harm me? Asbestos acts like dust and can be breathed in if it is in the air. Asbestos fibers can settle into the lungs and cause constant irritation and scarring. If you look at asbestos under a microscope, it’s easy to see why it causes this damage: the fibers look like sharp, jagged needles or splintered wood. Unfortunately, the fibers can also cause cancer to develop in the lining of the lungs. It doesn’t even take much exposure to asbestos for the risk of cancer to increase exponentially. When it comes to asbestos, it’s better to be safe than sorry. Can I do my own demolition if I think asbestos is in my home? There may be local regulations that prevent you from doing demolition or asbestos removal without a permit. You’ll need to wear protective gear, including a sophisticated breathing mask and full-body suit. Because asbestos behaves like dust, once it’s airborne it will follow the air flow. Therefore you may also need to create a negative air pressure situation that prevents air from entering the rest of your home while the materials are removed. Take great care not to break asbestos materials, as this will release asbestos into the air. Have a professional perform asbestos testing if you are concerned about its presence in an area of your home that you are remodeling or demolishing. If asbestos is found, it’s best to call in a professional asbestos abatement team before continuing with your project.